Back in March I wrote a post about a picture supposedly taken of a tornado in Georgia. The photo was being passed around Facebook, and it was an awesome photo. However, it was not of a tornado in Georgia the previous evening. It was a very cool phenomenon caused by an erupting volcano. This is supposedly Hurricane Sandy bearing down on New York City and Liberty Island. Well, guess what? Yep, you guessed it - it's NOT Hurricane Sandy. 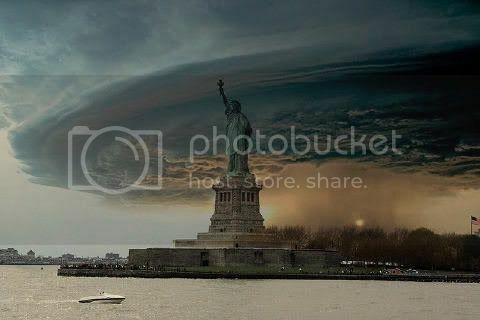 It's not even a 'real' picture - it's a Photoshop image combining a photo of the Statue of Liberty and another photo of a supercell thunderstorm from 2004. It looks really cool, but it's not the real thing. I haven't seen all the others floating around, but here's a list of 11 Viral Photos That AREN'T Hurricane Sandy. What can we learn from this? What should we have already learned regarding practically everything that we find on the internet, and that definitely includes Facebook? Check the facts before you forward or share those photos. Or emails. Or anything else. Maybe you think it doesn't really matter, but it's so easy for something to take on a life of its own. If you don't believe me, be sure to check out this explanation of How a Fake Photo Goes Viral.